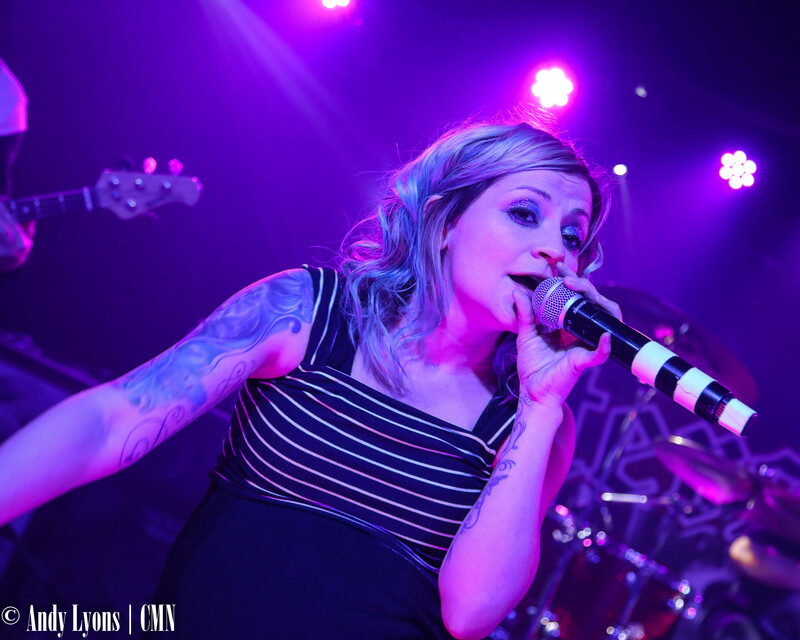 Lacey Sturm, former frontwoman of Flyleaf, stopped at Aftershock in Merriam, Kan., last week with support from five up-and-coming local groups. Sturm, who is heavily pregnant, ended the night with a high energy set playing originals, covers, and songs from her career with Flyleaf. The local groups got the night going early, with three-piece acoustic act Under the Knife hitting the stage at about 7 p.m. The group is anchored by the vocals of Melissa Bollman with Tyler Koehn on guitar and Jeriah Eager on guitar as well as playing a cajon and tambourine with his feet. They played a good mix of originals and covers, including the set closing “Billie Jean” by Michael Jackson. Next up was newcomer Lacy G, a Kansas City actress in her live show debut. The 5’1” singer hit the stage with her brother on drums and accompanied by a recorded track that played through the Aftershock P.A. For someone who had never been on stage for music, Lacy G had the commanding presence of a seasoned veteran. She has an amazing vocal range and the drumwork behind her vocals gave her sound an edge that warmed up the crowd – many who were there to see the heavy tones of Sturm. The diminutive singer had a big group of fans on the front rail who eased the crowd into her set. With her goofy nature, she was a natural at working the crowd between songs while her brother, Kyle Constant, prepped for the next track. While her vocals may have gone off key at times, her personality really shined through the set and the crowd responded in kind, giving her a huge ovation at the end of her set. Take the Day kept the energy level high, with bassist Rick Harrington the clear personality of the group. Their heavy sound picked up the pace of the evening with the crowd responding by headbanging and throwing the metal horns throughout the set. The next two bands slowed the night down a bit, lacking the same energy presented by Lacy G and Take the Day. The next act, Beyond the Grey, had a great rhythm section but with each member planted in their spot on stage the set seemed to drag on. The group’s vocals are reminiscent of Godsmack with a bit more of a Slayer feel to the music, but the set definitely lagged. As Noveria hit the stage, vocalist Victoria Bowman put the crowd on their heels with her screaming vocals with drummer Andrew Wilson delivering some good licks. Sturm’s set put the crowd over the top, with the loudest ovation of the night coming as she hit the stage. Her tiny 4’11” frame exaggerated with her pregnant belly didn’t keep her from holding back on the visceral screams she’s known for. Bassist Ben Hull and guitarist Josh Sturm, Lacey’s husband, add to the high energy of the set by consistently running, jumping, and leaning over the front rail to keep the crowd entertained. Sturm uses two boxes to stand on so she can see into the audience, and she used the opportunity to talk to the crowd about her faith. She took time to talk about how she was once an atheist who hated Christians, but on the day she had decided to end her life she had an epiphany and dedicated her live to God. Later in the set, she equated writing the song “Heavy Prey” for the film “Underworld: Awakening,” for a scene when the main character Selene’s daughter comes to the realization she’s the most powerful creature in the plot, to the life of Jesus Christ. Throughout the set, the crowd was a bit more in tune with the Flyleaf tracks – especially “I’m So Sick,” which catapulted Flyleaf to stardom in 2005. Fans could be heard singing along as she sang “Something I Can Never Have,” a cover of Nine Inch Nails that was performed live by Flyleaf during the Family Values Tour in 2006. The group plays a chill-inducing cover of Cory Asbury’s “Reckless Love,” during which Sturm is barely audible during the final verses. The music dropped as Sturm whispered “thank you,” sending goosebumps down the necks of everyone in the building. While Sturm decided to leave Flyleaf to focus on her family (both of her children were present at the side of the stage), she definitely hasn’t lost her touch. Her intense vocal range allows for some heartwarming melodies as well as brutal screams, something longtime Flyleaf fans look forward to. During the show, Sturm said she was due in July with her third child and fans can only hope she continues to take her family show on the road. For an extended gallery, be sure to visit Central Mo News on Facebook here.